PAWS (Pet Assisted Wellness Support) is the therapy dog visitation program at Appalachian Regional Healthcare System (ARHS). The program offers patients an opportunity to ‘pause’ and forget about their treatment for a few moments while interacting with a registered therapy dog. Animals provide many therapeutic and health benefits. According to the American Veterinary Medical Association, pet therapy can aid in achieving human physical, social, emotional and cognitive function goals. Pet therapy visits typically last a few minutes and can help reduce stress and anxiety, lower blood pressure, promote social interaction and provide encouragement and motivation during the treatment and recovery process. PAWS teams are available to visit patients at ARHS facilities upon request. 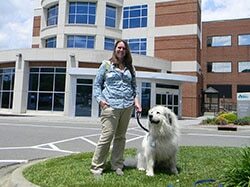 PAWS Pet Therapy Program at Appalachian Regional Healthcare System PAWS handlers must successfully complete the process to become an ARHS PAWS volunteer. Once approved, the dog and handler team receive an official (ARHS) Volunteer ID Badge and may begin visiting at an approved ARHS facilities. To volunteer with the PAWS program, call (828) 262-4408. Appalachian Regional Healthcare Foundation (ARHF) supports Appalachian Regional Healthcare System, which includes The Foley Center at Chestnut Ridge, Charles A. Cannon, Jr. Memorial Hospital, Watauga Medical Center and Appalachian Regional Medical Associates. The hospitals and outpatient facilities work together to enhance health care services and programs available in the High Country. The generosity of our donors is what makes programs such as PAWS possible. Lend a hand, or paw, and help the PAWS program thrive by making a tax-deductible contribution today! You may make an online gift on the Appalachian Regional Healthcare Foundation’s website or mail to Appalachian Regional Healthcare Foundation, PO Box 2600, Boone, NC 28607. To donate to the PAWS Program, contact the ARHS Foundation at (828) 262-4391.